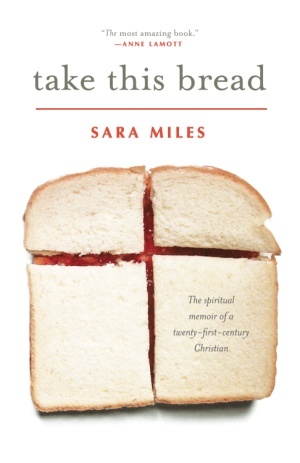 Subtitled, “the spiritual memoir of a twenty-first-century Christian,” Take This Bread is Sara Miles’s account of her journey into Christianity and the founding of the food pantry at Saint Gregory of Nyssa Episcopal Church in San Francisco. It’s an inspiring story of an unexpected conversion and an unconventional ministry at an unusual church. Miles, actually the granddaughter of missionaries, was raised by parents who rejected religion entirely. As an adult, Miles worked in New York restaurant kitchens before she took up a career in journalism, which brought her to the world of left-wing revolutionaries in Nicaragua and El Salvador. By the late 1990s, she had settled in San Francisco with her daughter, Katie, and her partner, Martha. They spent five happy years together before Miles wandered into Saint Gregory’s, took communion, and was changed forever. Miles’s conversion story is unusual in that she doesn’t come to the church having hit rock bottom. She’s happy; in fact, she believes it’s her gratitude that allowed her to be open to God. She’s also fortunate enough to enter a community of radical openness. It’s a community where a left-wing lesbian can feel right at home. Before long, Miles is excited enough about Jesus’s call to feed others that she asks her church if she can start a food pantry there that embraces the church’s radically open view. Anyone could come get a bag of groceries—no ID, no need to qualify, just sign your name. I found Miles’s energy and passion inspiring. She takes seriously the command to feed others, without exception. Because I tend to be cynical, I’d want to put all kinds of parameters on things: people who have to be referred by social services, to fill out a form, to do something to show they truly should get the food. Miles, on the other hand, would rather be taken advantage of than to refuse to give. Somehow, that seems like an attitude Jesus would have. Miles’s vision does create some challenges, but a few providential donations and the willing hands of volunteers—many of them who first came to get food and stayed on to give—keep the pantry going and even allow it to expand. The volunteers, a motley crew of characters if there ever was one, become a part of the church community. Not all of them attend Sunday worship, but the pantry becomes its own worship experience. For Miles, God is as present there as during a regular Sunday service. Religion for me wasn’t believing that God struggled to communicate a preordained plan in clumsy symbols or even in finely crafted sentences written down dutifully by the apostles. Instead, religion was like learning how to see. I was trying to make meaning from things I hadn’t previously paid attention to—the events I hadn’t bothered to see and the people I didn’t want to. Miles makes a distinction between orthodoxy (right belief) and orthopraxy (right action) and plants herself firmly in the camp of being more concerned with right action—loving others, feeding the poor, and so on. Personally, I think this is a false distinction; one need not choose between the two. I realize that in discounting orthodoxy Miles is responding to divisive arguments over fine points of scripture or on the tendency of some to only value those who think in the “right way.” She’s right to rebel against that. But that doesn’t mean beliefs aren’t important and worth grappling with and thinking about. What’s interesting about this to me is that in her embrace of orthopraxy, Miles makes some of the same mistakes that people who want to enforce the details of doctrine do. For her, the food pantry is a central ministry of the church, perhaps the central ministry. When others balk at her moves to expand into Sunday, she goes into a self-righteous fury. To her credit, she’s honest about her anger, but I’m not sure she sees the problem in trying to push her version of living out the faith onto everyone else. The writing itself is good, but after a while I thought that Miles tended to repeat herself too much. She does, however, do a great job at setting scenes and describing the people who come to the pantry and become part of it. At times, her language is coarse, and she’s frequently irreverent. Although I didn’t agree with Miles on every point, I did appreciate her honesty. She doesn’t mind talking trash about herself. It helped me, too, to remember that even though Miles is older than I am , she is writing about a time when she was new to Christianity. I know how I’ve grown and changed my views even in the last four or five years. I’d hate for anyone to hold me accountable today for what I thought 15 or 20 years ago, when I, like Miles, was new to the Christian life. It’s clear in this book that Miles sees herself as being on a journey, and she’s learning to see in new ways all the time. In writing this book, she’s helped me to do the same. This entry was posted in Memoir, Nonfiction, Religion. Bookmark the permalink. Sounds like an interesting book, I like that she is honest about her own flaws and journey as well. Her honesty really helped me get past the points where I disagreed with her because she wasn’t setting herself up as perfect. Sounds like an interesting read. I live in the SF Bay Area and have never heard of her before. I will have to look for this one at my library. If you’re local, there’s a good chance you’ll know some of the places and types of people she talks about, even if you don’t know her or her church. She goes out into different neighborhoods to promote the pantry and look for ways to expand it. Several other churches and other organizations started similar pantries at her encouragement.